Home » Health » Experts Weekly: How Can Africa’s Water and Sanitation Shortfall be Solved? Experts Weekly: How Can Africa’s Water and Sanitation Shortfall be Solved? At current rates, it will take sub-Saharan Africa 15 years to reach its water goals and 150 years to reach its sanitation targets. A group of experts explain what needs to change. 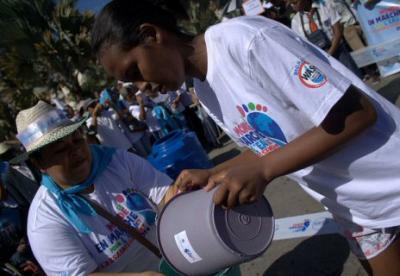 At the celebrations to mark World Water Day 2014 in Madagascar. Photograph by Diorano WASH Coalition. On 22 March, groups across the globe marked World Water Day, an occasion for highlighting the importance of water and sanitation as well as the many shortfalls in its provision. Water, sanitation and hygiene (WASH) are well understood to be critical to eradicating poverty, improving health, nutrition, education and gender equality, and enabling economic growth. Some 2,000 children die every day from diseases linked to water and sanitation; it is estimated that women in the Global South spend a cumulative 200 million hours a day collecting water, walking an average of 6 km a day, and carrying weights of up to 20 kg; lack of safe water and sanitation is estimated to cost sub-Saharan African around 5% of its annual GDP; and women are at far greater risk of sexual assault when searching for places to defecate at night time. Water and sanitation targets are both captured within the Millennium Development Goals (MDGs), with target 7c aiming to “halve, by 2015, the proportion of the population without sustainable access to safe drinking water and basic sanitation.” Debate remains around how access figures are calculated, but the UN estimates that while 783 million people still live without access to clean water, at a global level the water target has been met five years ahead of schedule. By contrast, however, sanitation is the most off-target of all the MDGs, so much so that UN Deputy Secretary General, Jan Eliasson, refers to the sanitation shortfall as a “scandal.” Currently, 40% of the world’s population – 2.5 billion people − lacks access to a toilet. In fact, more people around the world have mobile phones than access to toilets. In terms of both water and sanitation, Africa is far behind other areas of the world: across the continent, 327 million people lack access to safe drinking water while 565 million lack access to sanitation – 210 million more than in 1990. It is estimated that at current rates of progress, it will take until at least 2030 for sub-Saharan Africa to meet the MDG water target, and more than 150 years to reach the sanitation target. Think Africa Press asked a selection of experts on water and sanitation to evaluate why the situation in African countries is such, and what can be done to change it – whether in a national or pan-African context. A number of reasons are adducible as to why Africa lags behind in access to water and sanitation. First, it is about the failure of governments in the region to deliver essential services to their citizens, characterised by bad governance practices which are not particular to just the water and sanitation sector. Large amounts of money allocated to the water sector, including foreign aid, are often either misappropriated or outright stolen through corrupt practices. This is a major problem in most of sub-Saharan Africa and unless this issue is tackled head on, efforts to provide water and sanitation to the region’s poor will remain a pipe dream. Civil society groups in the water, sanitation and hygiene (WASH) sector need to rise up to their responsibility of mobilising citizens to hold their governments accountable and end impunity in water governance. A second point is the lack of political commitment. Governments, civil society and donors, as key stakeholders, have not demonstrated sufficient commitment to sanitation as evidenced by the meagre priority assigned to the issue in most poverty reduction strategies and national budgets. It is still a puzzle to many why sanitation is so often ‘left behind’. It is really shocking that schools and health centres are still built without toilets; that access to toilets is so far behind access to water supply; and that sanitation has failed to be translated from commitments into national policy and budget lines in most countries. However, there is some evidence that this is slowly changing at higher levels of policymaking, for example from the African Ministers’ Council on Water (AMCOW). There are also positive examples of local commitment to improved sanitation, including: the Ethiopian Ministry of Health, which is spearheading an initiative to roll out efficient support for rural sanitation through health extension workers; and the government of Nigeria and UNICEF’s work with the Society for Water and Sanitation (NEWSAN), under the aegis of the National Task Group on Sanitation (NTGS), to renew its approach to sanitation through piloting and implementing new ‘community-led’ approaches. Yet there is negligible evidence of commitment among many other key line ministries and at local government level. Countries such as Rwanda remain leading examples for the region. African policy makers and actors need to replicate what works in Rwanda in other countries, using local technologies. From the ongoing looting of Africa’s natural resource wealth, eco-social crises such as inadequate water and sanitation logically follow. Thanks mainly to non-renewable resource depletion, The Changing Wealth of Nations (World Bank, 2011) estimates that African wealth shrinks 6% annually. Beneficiaries are corporations from the West and from the BRICS (Brazil, Russia, India, China, South Africa) bloc. Nonsensical ‘Africa Rising’ rhetoric – reliant upon GDP growth notwithstanding fatal conceptual flaws – is dangerous for it promotes more extraction, typically accompanied by crony-state capture and abuse of water systems. ‘Acid Mine Drainage’ stretching from west of Johannesburg all the way to Mozambique is one example of minimalist ecological regulation by a corrupted state. Meanwhile water in our platinum belt is directed to mines rather than desperately thirsty people. Such looting leaves most African governments unable to finance even basic services to a frustrated citizenry. Capturing surpluses is harder because of: inadequate taxation, multinational corporate export of profits, and capital flight by the corporations’ local allies, including many state rulers. Even in South Africa, balance of payments deficits compel the Finance Ministry to borrow from abroad – to supply foreign exchange for profit and dividend repatriation – such that our foreign debt has risen by nearly a factor of six from the $25 billion inherited from apartheid in 1994. Lack of control over locally-generated riches leaves most African countries dependent upon ‘neoliberal’ donor aid. From Integrated Water Resources Management to Community-Led Total Sanitation, the message is to price water according to market techniques, commercialise retail supply via Western corporations, decentralise functions to (often bankrupt) municipalities, and adopt technology that limits operating and maintenance subsidies. Progressive civil society in many communities resist this and protest for affordable clean water. But the larger problem is structural: it is predatory capitalism. Political stability and economic progress are key in developing the water and sanitation sector. However, political will and commitment can help overcome some of the challenges faced by more vulnerable countries where economic and political stability are more fragile. Wherever there is commitment, change is possible. The lack of political will has to be one of the most serious stumbling blocks because without it there is little hope of progress. Even if the international community, development partners and civil society agree that the water and sanitation sector needs more attention, you simply cannot impose a water and sanitation agenda on any government. This must come from within, from a conviction it is the right thing to do and the right time to do it. A lot of campaigns have helped raise awareness and provide governments with the knowledge and information necessary to make different decisions, and we feel they are showing results. The African Minister’s Council on Water (AMCOW) has been a driving force in efforts to bring attention to the issue by mobilising and sensitising stakeholders by providing them with improved data. Yet government allocations alone will not be enough, which brings us to the other issue: the lack of investment. The investment required to keep pace with the growing demand and rapid urbanisation in Africa is estimated at $50 billion per year for the next 20 years. Forecast on annual spending required for the water sector reveals a sizeable financing gap and an increased need for non-traditional funding sources. Future annual spending on water supply and sanitation is estimated at $21.9 billion, compared with current spending levels of $7.6 billion. The African Water Facility was created to help prepare more bankable projects to attract investment and boost the water sector. So far we have been able to mobilise €935 million ($1.3 billion) and hope to reach the €1 billion ($1.4 billion) mark in the next few months. It may seem like a drop in the ocean considering the amount needed every year, but with more capacity the Facility could draw a lot more. Our leverage ratio is around 1:30, which is to say that for every Euro we invest, we get 30 back. Another issue is the inadequate decentralisation of power. We have seen several cases where local governments are made responsible for implementing water and sanitation programmes and initiatives, but do not handle the financial resources which are instead managed by central authorities. This dramatically weakens their ability to implement those programmes in a timely manner, or at all. Finally, while we all agree that the private sector can play an important role in catalysing the development of the water and sanitation sector, governments need to do a lot more to create an enabling environment and to allow for an attractive market to attract private investments. Our role is to help countries prepare for this by increasing resilience and promoting the expansion of water and sanitation services through a holistic water resources management approach as well as through projects aimed at improving service delivery, including business models and social, institutional, financial and technical innovations, as well as public-private partnerships. North Africa and sub-Saharan Africa have made different levels of progress towards the MDG targets on water and sanitation. North Africa has 92% water coverage and is on track to meet its 94% target before 2015. However, in sub-Saharan Africa, nearly 40% of the population lacks access to improved sources of drinking water. There are a number of factors which explain why Africa is lagging behind. Lack of policy and strategy backed by political will is regularly cited as one major cause of insufficient progress on both improved water and sanitation. Firstly, ministries of finance seem unconvinced about investing in sanitation. Secondly, national governments are not willing to decentralise fiscal authority to local level to enable implementation. Thirdly, there are various governance challenges, including corruption. Consequently, water and sanitation fall off the list of priorities at national level. Countries are also failing to meet their high-level commitments on water and sanitation in Africa (such as eThekwini, Sharm El Sheikh and Sanitation and Water for All – SWA). Inefficient sector financing investments remains one of the greatest challenges. The African Development Bank (AfDB) estimates that Africa currently has an annual financing shortfall of $8.1 billion to meet the MDG targets. The absence of adequate or inefficient donor financing mechanisms remains one of the key challenges. Governments in Africa are also believed to not be making requests for sanitation funding, and they tend to leave it to donors or NGOs to foot the bill. The absence of effective coordination within government agencies and between external agencies is also a hindrance to progress on WASH. Agencies like AMCOW and the AfDB highlight the problems of coordination and reluctance of NGOs to align themselves with government priorities. Cross sector linkages involving ministries of health and education also remain one of the challenges. Institutional reforms in the WASH sector have lagged behind, resulting in challenges and confusion around institutional roles and responsibilities at various levels. WASH Sector Performance monitoring is one of the greatest challenges facing Africa. Getting funds allocated and disbursed for what they are intended is also a problem. And implementation procedures are not respected and monitoring mechanisms are not addressing these shortfalls. Other important factors include the private sector not showing much interest in entering the WASH sector, particularly with regard to rural sanitation and in peri-urban areas. The current water supply and access situation in Africa is a bit more serious than “lagging behind.” ‘Lagging’ in my opinion greatly understates the situation of continuous deterioration of water systems which produce limited access for a significant part of the population or high costs for those with the ‘privilege’ of access. On the question of why this is the case, the explanation is complex but also simple.